I kinda thought they would itch, but turns out they don’t. Anyway, I jump ahead. Hello! Welcome to my blog. Well, not my blog as such, but Sarah’s blog. And given I’ve started by referring to her in the third-person I guess I’ve got a ways to go before she/I get properly integrated. So, what’s this blog about? FASHION! Not today’s fashion which, as a 70s and 80s child I find scarily similar to what I grew up patently ignoring, but the fashion of yesteryear. Sarah is the person I embrace occasionally, the girl that I see as femininity. The girl I’d like to see as I ride the Tube, sip my coffee in Starbucks or Costas, grab a beer or seven after work. She is what I think, personally, girls should be like. I’ll quantify that a moment. I’ve always had the urge, the itch, to change myself and present myself to the world as a woman. Not become a woman because, hell, blokes have it good in the civilisation (sorry ladies), but more to put on the costume and revel in the delicious feel of femininity. I’m not a sexist. Or a racist. Or basically anything-ist, other than live and let live-ist. I treat everyone I deal with on a day to day basis as the same, I don’t distinguish between gender and I have the world’s worst gaydar (I really don’t see what people are and don’t judge anyone) *but* I love the femininity of early era fashions. So when I reached a certain age and decided to let the inner girl out, the choice of how she would dress and what she would wear wasn’t even a choice. I found some cool websites, bought some dresses and took the plunge. I found an utterly wonderful dressing service (I can hardly work out how to wash, nevertheless put makeup on) and threw myself into the idea of dressing. Shaving isn’t as fun as it sounds. For a start, I’d never shaved my legs. I’m not that hairy, but hairy enough, and since my second marriage to my soulmate my male hormones have exploded in glee, so sitting in the bath and scraping off 4o+ years of leg and arm arm was entertainingly difficult. And when I was done I finally understood all those comments I had seen from fellow Transpeople about the feel of shaved body parts. It feels……odd. It feels cold and silky. Until you get into bed, and then the nerve endings get all wobbly and report to the brain that your legs are wet. Plus the absence of hair means you can’t get a lather with shower gel. But so worth it. Putting stockings on is like dipping your finger into chocolate. The feel of a dress flowing over your legs is like nothing I’ve felt before. It makes you want to giggle, which is such a girlie thing but so apt. But I digress. This blog will be an exploration of the fun I’ve been having, and the fun to come. I’ll be talking in depth about the dresses and experiences, I’ll not be talking about politics, sport, food, drink, relationships. I may stray into girlie giggles and squeals but, you know, if you dress a certain way your brain starts to behave a certain way. So welcome and well met. My name is Sarah and I will be your hostess for the evening. perhaps this is the subject of an upcoming post, but how did sarah get interested in retro fashion? 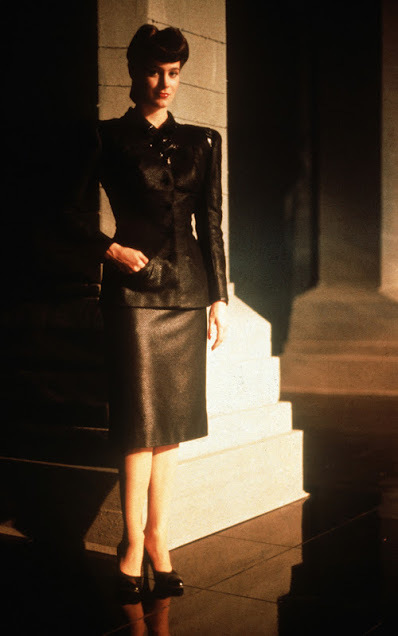 I honestly don’t have a clue 🙂 I’ve always loved retro-fashion – my earliest memory of feeling the urge to wear it was watching ‘Blade Runner’, where Sean Young has the most beautiful black 40s style frock I’ve ever seen, and I found myself wanting to look just like her. Other than that, I think it is a combination of the accentuated femininity of retro-fashions and the role that women had then as opposed to now that fascinates me. If you want my feedback on the TG experience, here goes. I first shaved my legs a week or so after I made my first frightening excursion en femme in public to buy some ladies shoes for my big feet. Shoes are very size-critical and cannot be fudged like free-size clothing. My shopping outfit included a pretty burgundy top, a crappy wig, all the needed accessories, and good face and eye makeup with lips and nails painted to match my top. I couldn’t wear any of my skirts in public unless I had appropriate shoes, so my black pants and fitness shoes were both gender neutral so I could try them on in male mode and still wear them with a ladies top. After the sales person measured my feet for the male fitness shoes and went to the stockroom to get them, I flipped the measuring thingy around to see what my ladies size would be for the planned “mission.” Size 13. I walked out the front door en femme only when my NEED to be out as my femme self exceeded my fears of being “read” and possibly ridiculed. I had no fears of my physical safety (and still don’t) because I am tall, fit, well-trained, and experienced as a soldier. At that time I was a tank commander whose division was on alert for the 1990 Gulf War, and I was far more frightened of what people might say than I was of going back into combat in a new war. I survived my “mission” to get some pumps that would enable me to wear my skirts with my tops; however, to get the right feel and look, I needed to shave my legs and armpits. It was messy the first time but felt nice and smooth. Then came the problem of what would my buddies might think about my smooth legs. It turned out they never noticed and damn sure never felt my legs or thighs. I was in the National Guard at the time, which is like the British Territorial Army. We usually trained one weekend a month, at least two full weeks (usually in the summer), additional schools as needed, and deployments whenever an emergency is declared. Whenever I finished a training period or deployment and got home, I would clean up, shave my legs, and paint my toenails. I got dressed up and dolled up most weekends when I wasn’t on duty and many week nights, especially after I located a local TG group. It was necessary to trim my fingernails just before a meeting, but I’d let them grow out for another month, and I usually painted them for most weekends. Although we had Guard meetings every month, the time between meetings varied from two to six weeks. Once there was enough time for me to get my ears pierced, keep the CZ studs in for the required first month, and have them out before the next meeting. Then at a unit party (in civilian dress), I found that half the younger guys in my tank company wore earrings off duty. When I retired from the Army in 1999 and transitioned, I went to my armory and turned in my equipment and uniforms en femme. Ah, those first, heady, exciting days of leg shaving. Wearing tights and stockings now was a revelation! I couldn’t stop touching them. Later still on another feminine adventure I dared to shave my chest and body too. I commandeered one of my Mum’s old nighties to sleep in. I can tell you that the explosion of sensations meant that I didn’t sleep much at all, though the rollers in my hair might have played a part in that too! Now, all these later I don’t get to shave anymore. I do miss the feeling but not necessarily the faff. If I want to have the appearance of smooth legs when I dress I have to wear three pairs of tights. Never experienced the “wet” feeling of legs Sarah, but tend to use veet or nair before going for a photo shoot or meeting another femme dresser. Loving your blog and Flickr.